National Guard issued the following announcement on Nov. 16. 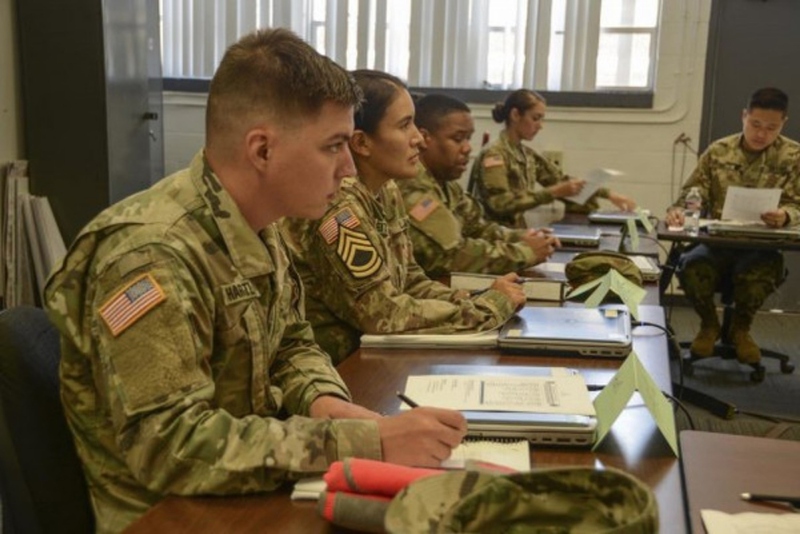 The Louisiana Army National Guard's Multi-component Cadre Basic Leader Course (BLC) at Camp Cook in Ball has implemented a new course curriculum. The BLC revamp is part of the Army's Noncommissioned Officer 2020 initiative released by the United States Army Training and Doctrine Command in 2015 along with the publishing of EXORD 236-15. The NCO 2020 will develop the next generation of professional NCO's that can thrive in chaos and ambiguity, as well as adapt and win in a complex world by being provided with appropriately designed learning experiences at each level of leadership. The curriculum was introduced at the end of the summer. "The new curriculum really puts the emphasis back on learning and allows it to be put in the student's perspective," said Command Sgt. Maj. Christopher Maxwell, commandant, 1st Battalion (NCOA), 199th Regiment (Regional Training Institute). "Students are learning through their experiences, skills, knowledge and other Soldiers' prior experiences. The BLC redesign puts 'leadership' back into leader development." The BLC is the first course that junior-enlisted Soldiers attend to learn the fundamental leadership skills needed to lead a team as NCOs, and the revamped curriculum is designed to improve training and education expertise in the NCO Corps. BLC focuses on the Six Leader Core Competencies, which are readiness, leadership, training management, communication, operations, and program management. "There's a fine line between training and educating," said Staff Sgt. Victor Turner, a facilitator at the BLC. "When a Soldier comes to his professional military education course it's designed to educate the Soldier and not train them. The training should happen at the organizational level. So, I'm going to evaluate the Soldiers on their ability to train other Soldiers." In 2016, the LANG's BLC become one of two multicomponent course locations, the other located at Fort Carson, Colorado. The academy is led by a National Guard commandant and has cadre assigned from all three components. This year the BLC is prepared to train a combined 1,760 Soldiers from the active duty, National Guard and Army Reserve. The 23-day course is now broken into four phases: foundations, leadership, readiness and assessment. These build upon each other to improve critical thinking, communication and leadership skills. "The students start in the foundation phase, where they have their main facilitators," said Turner. "Students then rotate to another set of facilitators for the leadership and readiness phases. They return back to those homeroom facilitators for assessment phase, which is basically finals week." The facilitators start each section with a concrete experience that students then discuss or conduct a practical exercise based on the experience. The BLC redesign uses the Experiential Learning Model (ELM) which is geared for adults and is learner centric. "When you have people from all different backgrounds it really pushes everyone to expand beyond their own experiences," said Spc. Shelby McCloudrey with the Army Reserve's 409th Engineer Company at Fort Collins in Colorado. "The group discussions help us build social relationships and really improve as communicators with other Soldiers." Soldiers write an informative essay, two reflective essays, a resume and a Sexual Harassment Assault Response and Prevention essay while attending the course. The Soldiers are also evaluated on public speaking, physical readiness training instruction and squad drills. "The essays help me see what is expected of me as a noncommissioned officer because I know there is a lot of writing involved," said Sgt. Andrea Keiter with the Army Reserve's 282nd Engineer Company out of Colorado. "The essays are a foundation. something to build on in the future." These assignments help teach the Soldiers how to write professionally and effectively communicate using basic English and grammar. As Soldiers progress through the years in their professional military education, the writing will increase in difficulty. "Soldiers come in knowing how to shoot, move, and communicate; but we throw in writing essays and grammar," said Staff Sgt. Timothy Bouyea, a facilitator at BLC. "A Soldier can give you an amazing brief and be able to completely explain everything, but often go blank as soon as you tell them to put it to paper." "It's our job to make sure they are able to convey information in a professional manner," said Bouyea. Command Sgt. Maj. Howard Ivory, the LANG's logistics senior enlisted advisor, was the guest speaker for the class graduation. He spoke with the graduates about what it means to be an NCO. "Graduates, give yourself a round of applause. Now I don't want to burst your bubble, but you're going to get very few of those in your future as a leader," said Ivory. "We don't do what we do for the applause or awards, we do it because we love it, and it's the right thing to do." The RTI was established in 1976, and taught its first course in 1977. The unit received "Institute of Excellence" ratings from Training and Doctrine Command in 2006, 2010, 2013 and 2017, and received the Army Superior Unit Award in 2013. Want to get notified whenever we write about National Guard ? Next time we write about National Guard, we'll email you a link to the story. You may edit your settings or unsubscribe at any time. Thank you for signing up for American Security News Alerts! Please select the organization you wish to subscribe to.